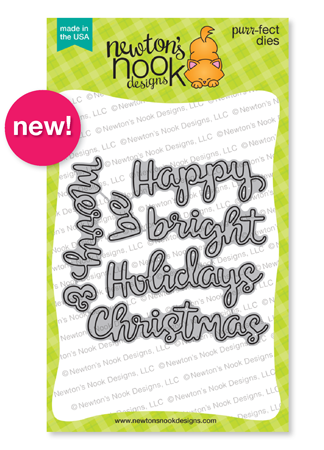 Newton's Nook Designs: Holiday Reveals - Day 1 - Winter Memories Stamp Set Plus New Dies and Stencils! Holiday Reveals - Day 1 - Winter Memories Stamp Set Plus New Dies and Stencils! Today is the first reveal day for our Holiday Release! This month we are releasing a ton of amazing Holiday stamp sets, die sets and stencils! Keep checking back each day to see it all! Today we are starting things out with our elegant Winter Memories Stamp Set. Plus we are revealing two new stand alone die set and THREE new Stencils! We giving away the Winter Memories stamp set today away one lucky winner so make sure you read all the way to the bottom of this post to see how to win! Celebrate winter and Christmas traditions with this lovely 4x6 stamp set. 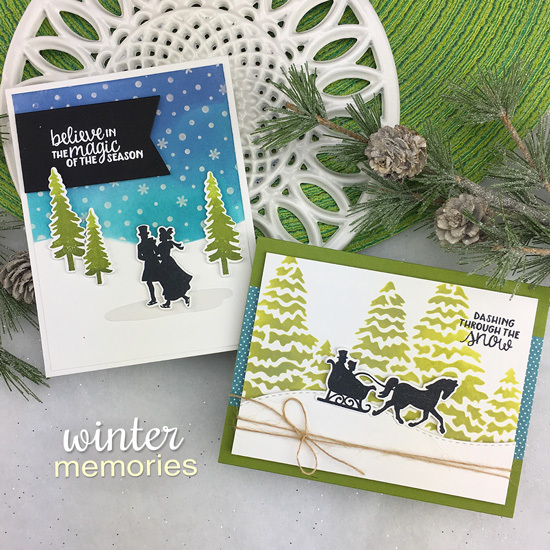 This set features silhouettes of winter activities with a vintage feel and is perfect for elegant winter and holiday cards. Add the ice skaters onto the pond and use the trees to create scenes. These bold images are great for embossing too! These gorgeous holiday word dies are perfect for adding seasonal sentiments to your cards! This set includes 6 word dies and an ampersand that you can mix and match to create your favorite holiday sentiment. Some possible combinations are: Be Merry, Merry & Bright, Happy Holidays, Merry Christmas, Be Happy and more! 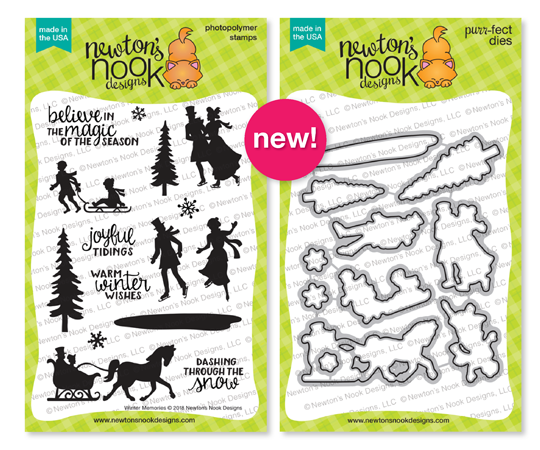 This month we're adding THREE new beautiful stencils to our product line that are perfect for the Holidays! 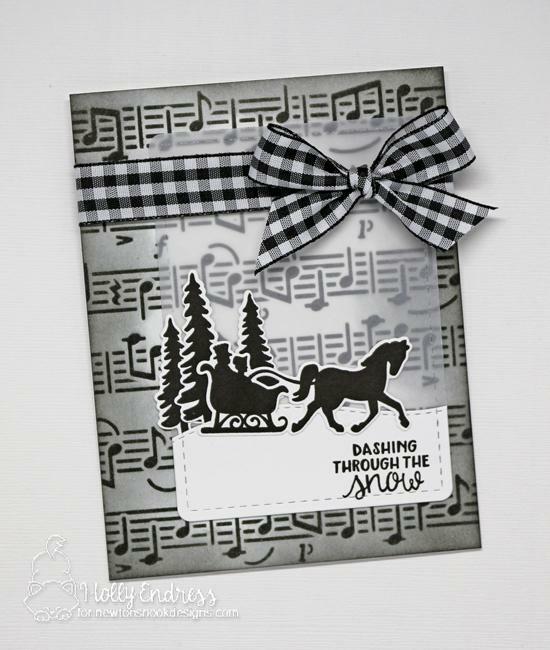 The Music Stencil (below left) is perfect for adding a touch of elegance to your holiday cards. The Evergreens Stencil (below center) features gorgeous trees that will make great backgrounds for winter and woodland scenes. The Petite Snow Stencil (below right) includes tiny flurries of snow that are perfectly sized to create backgrounds for all our character stamps! This trio of designs will be essential for all your Holiday cards and more! Get ready for some amazing card by our Design Team using these new products! This amazing winter scene was created by Juliana using our new Winter Memories Stamp Set to create those lovely silhouettes and snowflakes! She also used our Land Borders Die Set for the snowy hill and our Framework Die Set for the postage edge panel. Tatiana created this amazing sparkly winter card using several of our new products! She started by stenciling those trees using our new Evergreens Stencil and then added a layer of tiny snowflakes on top with our Petite Snow Stencil. 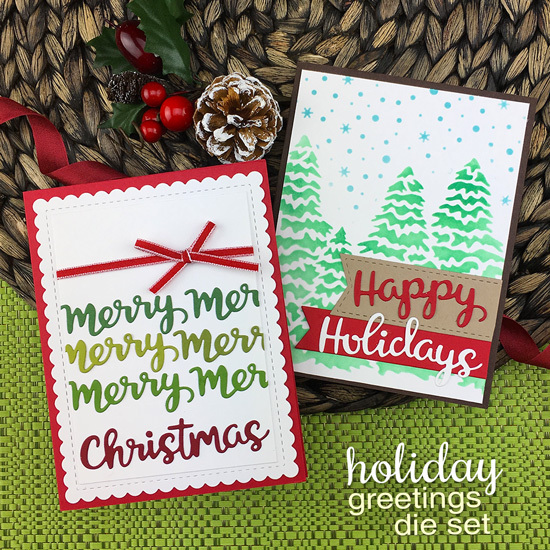 She added in the Happy Holidays die cut words using the new Holiday Greetings Die Set with sparkly silver paper! Samantha made this stunning skating scene using the ics skating couple, ice pond, and trees from our new Winter Memories Stamp Set. 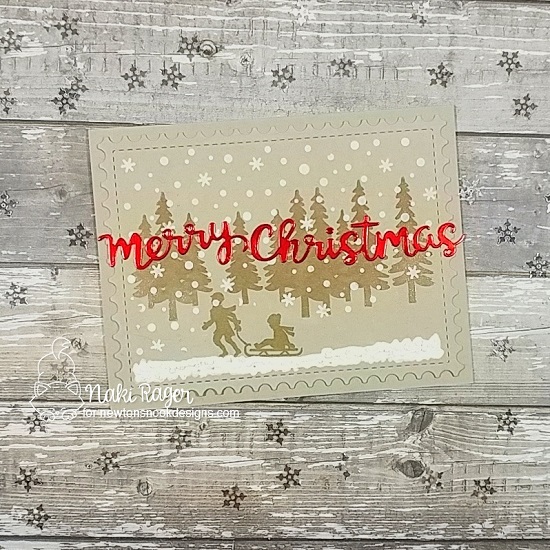 She added a gorgeous pink watercolored sky and stamped the words from the Winter Memories Stamp Set, adding on the die-cut "Christmas" using the Holiday Greetings Die Set with sparkly gold paper! This card by Naki has a gorgeous vintage feel to it! She used the silhouettes of tree and the sledding kids from our Winter Memories Stamp Set. Then she added that lovely snowy sky using the new Petite Snow Stencil with white embossing paste. She finished out her card with a sparkly red "Merry Christmas" sentiment that was die cut using our new Holiday Greetings Die Set. The postage edge panel was cut using the Framework Die Set. 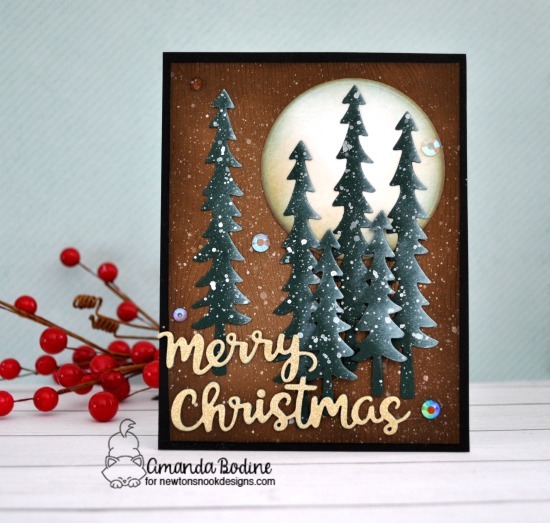 Amanda created this gorgeous woodland scene using the tall pines from our new Forest Scene Builder Die Set. She added a lovely moon behind the pines and added snowy paint splatters to the top. Then she added the "Merry Christmas" sentiment, die cutting it from gold using our new Holiday Greetings Die Set. 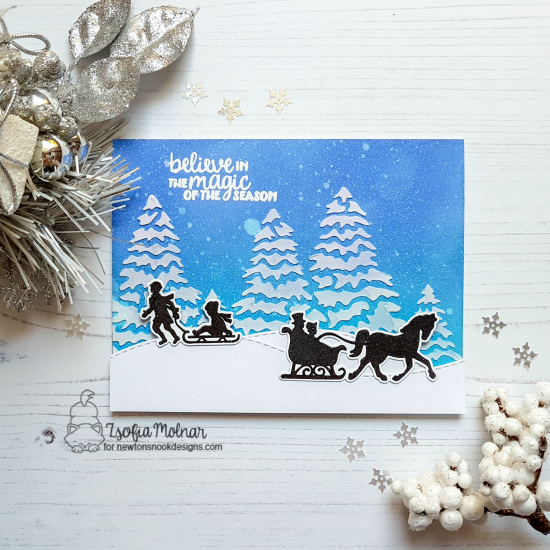 Zsofia created this lovey winter wonderland using our silhouettes from the new Winter Memories Stamp Set in front of hills that were created with the Land Borders Die Set. 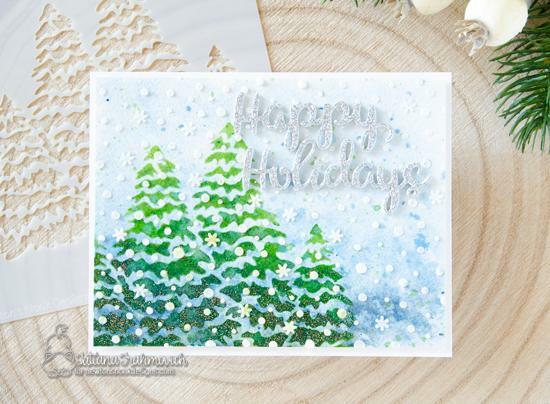 She used the new Evergreens Stencil for the lovely white trees in the background too! This amazing black and white card was created by Holly! She used the silhouettes from the new Winter Memories Stamp Set in black over a vellum rectangle that was cut out using our Frames & Flags Die Set. She added on some snow with our Land Borders Die Set. For the background she used the new Music Stencil. So elegant and pretty! 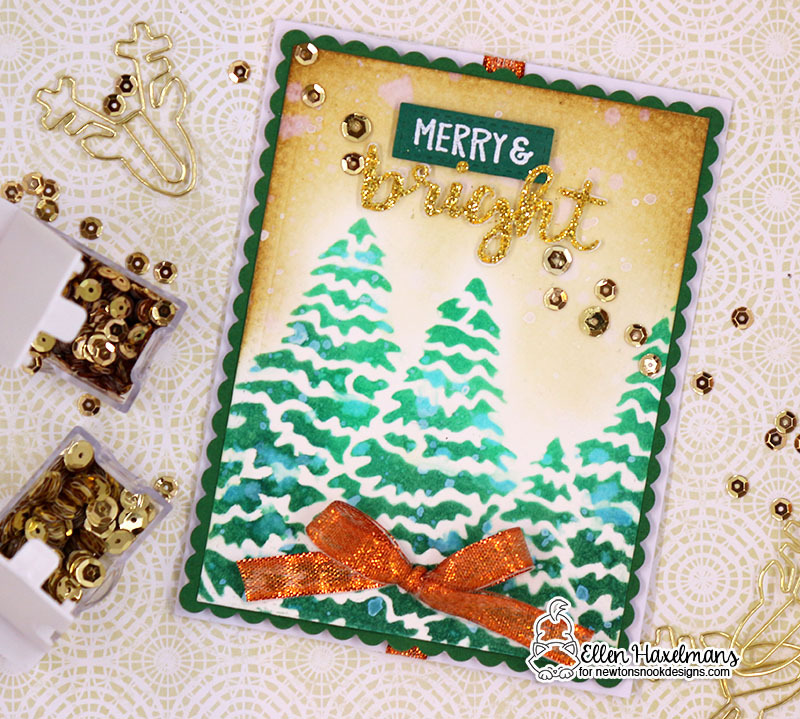 This gorgeous tree card was created by Ellen using our new dies and stencils! She created the fun tree image using the trees from our Evergreens Stencil and added sky above them with distress inks. Then she added the custom sentiment, stamping "Merry &" from our Sentiments of the Season Stamp Set and added the die cut "Bright" using our new Holiday Greetings Die set with glittery gold paper! She also used the scallop edged background from our Frames & Flags Die Set. 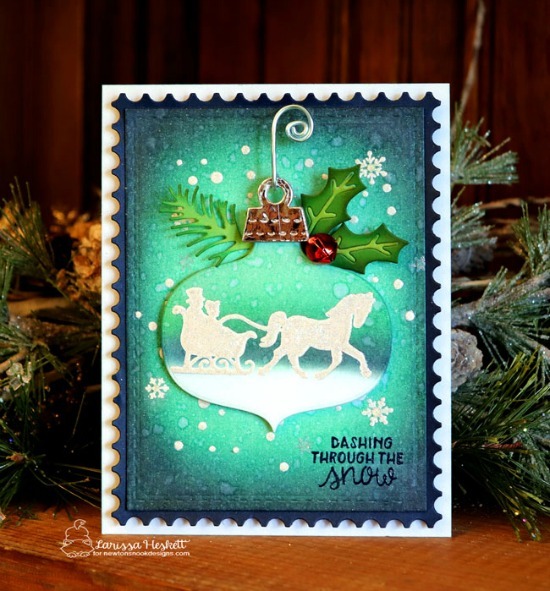 Larissa created this stunning card using the silhouettes from the new Winter Memories Stamp Set embossed onto an ornament! (Shhhh... the ornament shape is a sneak peek of a die set that we'll reveal later this week!) She used our Pines & Holly Die Set to add the holly and pine branches along the top. She also used our Framework Die Set for the postage edged panel. This gorgeous winter scene was created by Maria! She used the sleigh silhouette from our new Winter Memories Stamp Set and created layers of snowy hills for it using our Land Borders Die Set. 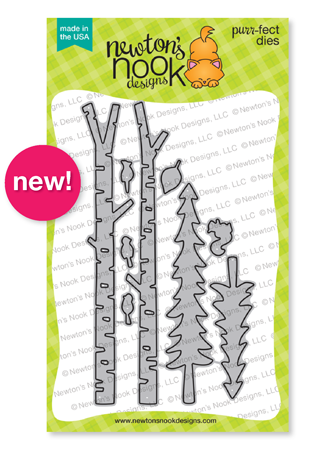 She also added in the lovely birch trees and birds using the new Forest Scene Builder Die Set! Would you like to win the “Winter Memories" Stamp Set? Here's how to win: Comment on the NND blog and Design Team blogs (see list below)! The winner will be chosen at random from the collective reveal posts. Make sure to check out each of their blogs and comment for your chance to win. You will not know which blog has been chosen so the more you comment on the better your chances are of winning! You have until Thursday October 18th at 9pm EST to comment -- winners will be announced on the blog post on Friday, October 19th. OMG!!! I'm soooooo in loooove with all the stunning examples! I'm very curious to see every time what everyone came up with and every time I'm surprised with fresh and creative interpretations! TFS!!! Love the new product and beautiful cards. Thanks for sharing. Such pretty cards! I love all these new supplies! Especially the new stencils and dies! WOO HOO - your holiday releases are always the BEST! Awesome cards! :) This new release looks like it is going to be filled with great new goodies! WOW, such pretty cards! I love all the variety as it shows how versatile these new goodies are! The stencils and sentiment dies are a must have for sure for any holiday crafts! I love everything about Christmas so I am smitten with everything! All of the cards are just beautiful. Wow, love this release! I saw the sneak peaks on IG and had to come see them! Great creations - love all of them! Wow. I see some stuff I'd definitely love to have in my stash. I really like the Forest Scene Builder Set, and the Tree stencil. Also love the snow stencil! Oh man, these samples are gorgeous! I love Amanda's woodsy moon card, and Tatiana's sparkly trees. Nice collection of stamps and stencils. Wow! What wonderful cards, stamps and dies. Amazing release. Beautiful inspiration! The design team did a fantastic job. OMG I love the Winter Memories stamp set!! What a beautiful and romantic stamp set!!! Love it and all the other new products!!! So, this set is absolutely stunning!!! Gosh! I want them all! And, the cards posted here are breath taking! Nice work! These new sets are wonderful! Love all cards from team! That set with the sleigh is going to be very popular. Really nice! The evergreens and birch trees have sparked so much inspiration! I love trees (and they're pretty rare around here) so I'd use these year 'round. Friday, hurry up and get here! Ooooh, today's releases are fabulous!!! Love these cards, they're so pretty! Wow what an amazing first day of release! I absolutely love the winter memories set and your stencils are just incredible. Simply outstanding release!!! The winter scenes and those evergreens are amazing! Love the new holiday release & the beautiful cards made using them! Really unique & creative designs! These winter siloutte are all so beautiful! Aren’t these cards lovely. Thanks for the great giveaway. Amazing new products! I absolutely love the nostalgic feel of the Winter Memories set and the stencils are fabulous. Once again I'm amazed by all of the beautiful cards. I love all the new products and look forward to getting them soon. I'm anxious to try the stencils. Still can't figure out how to get into Maria Russell's comments. I love the cards and the colors she used just can't find the comments section. Beautiful inspiration cards & stamp set. OMG ! What a fabulous series of stamps, dies and stencils ! The cards presented are so beautiful and inspiring.... I love, love, love !!! These are amazing - love all the inspiration! All the cards are gorgeous. I do not NEED any more stamps BUT I WANT so many Of these new stamps. And the stencils -- I NEED them. Congratulations on a fabulous new release!! What a great release. I just love everything about this release. These are all awesome, excited for the October release! OOOH this set is a MUST have - love it!! What a great release! Makes for PERFECT CHRISTMAS scenes! Love all the new products but my favorite is the Winter memories stamps and dies! I had planned and purchased my Christmas cards already but I may have to rethink it now. Awesome winter scenes with these beautiful designs! Oh my, the new release has fabulous new products!! The cards are gorgeous. The Design Team did an amazing job. trees are fantastic. Great stencils. These silhouette stamps are so elegant. Beautiful stamps so elegant! Out of curiously is the music stencil a known song? Love the stencils and the word dies! It's all so fabulous and it's only day 1! Can't wait to see what else you have! Such a beautiful ole timey picture of Christmas! Love it! Such creative stamps, dies and stencils! Great release! The Winter Memories stamp set is wonderful! Wow! These are so beautiful! I love the new stencils! Stunning, amazing! 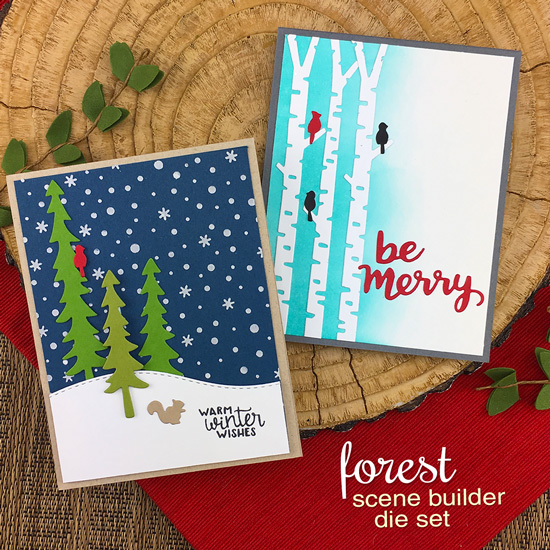 Love the forest scene die builder! What a great new release. Such wonderful inspiration from the design team. Love this release, it's really wonderful. Very pretty cards from the DT too. Love them all.